“If God knew me the way I knew me, He wouldn’t love me” – Samantha Lee-Gibson on her past relationship with God. 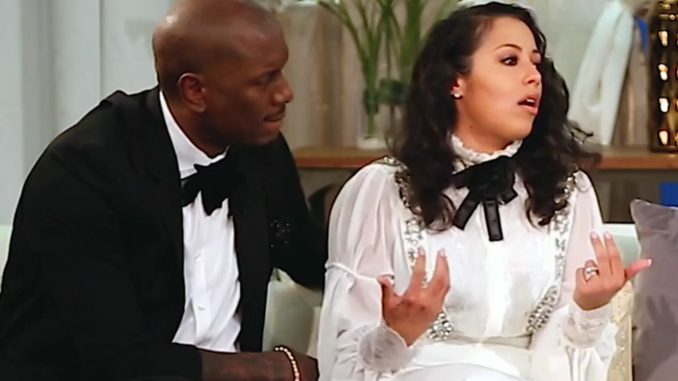 Tyrese knows he got a thing for troubled women! The 38 year old actor/singer and his “#BlackQueen sat down with the pastor who married them, Creflo Dollar for the 100th episode of his “Your World” talk show, to discuss how their relationship with God ties into their marriage. “My background isn’t squeaky clean. Obviously, none of us are perfect, but I didn’t come from the best of everything or anything like that. Our family had struggles and everybody has got their own level of dysfunction. Mine was pretty dysfunctional”, says Samantha. “My whole life was not peaceful. It was fights, my father left – just a lot of things I was dealing with”. “If God knew me the way I knew me, He wouldn’t love me”, said Samantha, who would later become a social worker. Samantha says she remembers feeling “not worth it” and when a kind woman prayed over her one day, it changed her relationship with God. “Why me? Why are You doing this for me? Why am I still alive? Why haven’t I been to jail? Why am I not one of the homies that’s in the box right now, dead that’s on some ‘pour out a lil liquor’? Why that didn’t happen for me? I was right there with the Crips, with the Bloods, with the Esés, with the drive-bys. I done seen too many of my homies get popped right in front of me – and clearly, God has an assignment on my life”. Samantha says she was hesitant to talk to Tyrese, considering everything that was in the news about him, but threw caution to the wind when mutual friends encouraged the two to date. However, once they exchanged information, it took Tyrese 2 years to contact her again. “‘God, you can send me a burning bush! I’m not gone run from the burning bush, but, it turned out that [Tyrese] was just as geniuine as he said he was”, she says. “You know, at first, to be honest, it got to me, but I kept praying. I kept saying to myself ‘I’m allowing this energy to affect my everyday life and these people don’t do anything for me. They serve no other purpose, but to tear me down. So, I really had to go to God about letting it go and really focusing that energy into my marriage and making it work”, said Samantha. “Haters got a job to do. Nobody wants to be unemployed”, joked Tyrese.